But riding the subway with a large suitcase can have pitfalls. When I woke up on Sunday morning, I huffed, puffed, and probably rolled my eyes when I saw this sign. I packed my bag and walked two blocks to 12th Street to take the bus to the Woodley Park metro station. When I got to the bus stop, I dreaded the bus ride and transfer to the subway, easily adding 30-40 minutes onto my 45 minute trip, but had resigned myself to the situation. An older woman, probably in her upper 60's, stood in the bus stop line with a large suitcase like mine. She also had a carry on tote and a large purse. Wearing her blue and white striped dress with a red blazer, I suspected that she had also been at the DAR event. As the bus approached, I offered to help her to lift her suitcases on the bus. We started to talk and I learned that she had enjoyed the congress as much as I had. I assumed that she was from Maryland like me because she was riding public transportation to the Maryland state line, but found out that she was from Dallas, Texas. She had quite a bit of luggage and was headed out of the city. As it turns out, she was on her way to attend a church service at a church near the Friendship Heights metro station that someone had mentioned to her. "After all," she said, "It's the Lord's day." Immediately after church, she planned to get on the subway/bus combination, changing lines and stations, in order to arrive at the Reagan National Airport for her flight home. Silently, my mind whizzed in awe of this woman. She made a sacrifice and had a difficult journey to go to church in a strange city. Her challenges were greater than mine, yet she enjoyed this journey. Her determination and grit is a characteristic that can teach us all a lesson. The escalator going from the street to the subway train at the Woodley Park is incredibly steep and long. As I held my suitcase, her suitcase, and her carry on bag, the woman closed her eyes and firmly held on to me and said, "I suffer from vertigo!" Finally on the train, the woman thanked me for my help and said, "The Lord always provides. I am so grateful that he sent you to me on this journey." Long after we said goodbye, I continued to think about the woman. I believe that God didn't send me to her...he sent her to me! Without this woman's example of strength and determination, it would have been easy for me to complain about what was really a minor inconvenience. Without knowing it, she helped me to put the situation in perspective. I hope that you like this Lilly Pulitzer print bookmark that I made to share with you. 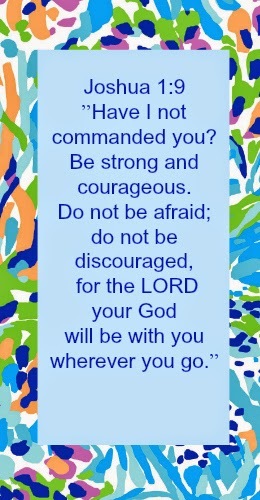 It's one of my favorite Bible verses and give me strength when I need it. Bethany, What a wonderful story. It says a great deal about you! It would have been so easy to just board the bus and not strike up a converstion with that lovely lady....but you did. What a kind and thoughtful person you are! Thank you for the bookmark. What a lovely encounter. I love this post and I so agree when you said that instead of God sending you to her, He sent her to you! I was just able to do a kindness to an acquaintance and she sent me an email thanking me. I told her that I considered it a blessing to be able to help someone out. Here is my little prayer: God grant me the opportunity to help my fellow man. Oh how I needed to hear this! I have been struggling with keeping things that happen in perspective. I have had some people be very mean to me this year but I know that the Lord goes with me always. Thank you for this story and the bookmark!